In the midst of the summer driving season, the price of a gallon of gas continued to rise this week, and President Obama’s job approval rating continued to fall. Inquiring minds want to know: Do Americans believe the president has any power to control gasoline prices? It turns out the answer depends on whether you ask a Republican or a Democrat — and which party occupies the White House. Ask Democrats when a Republican occupies the Oval Office if the president can do a lot to control gas prices and a big majority will answer yes. But when the president is a Democrat, well under half of all Democrats say the chief executive has any real power to influence fuel costs. The effect is nearly as strong among Republicans: GOP partisans are far more likely to say the gas buck stops with the president when a Democrat is chief executive. About 71% of all Democrats said presidents could do a lot to rein in gas prices. Six years later Democrat Barack Obama was president, and CBS/New York Times repeated the same question in their March survey. This time, 42% of Democrats said the president had the power to influence the price of gasoline — fully 29 percentage points fewer than those holding that view when Bush was president. 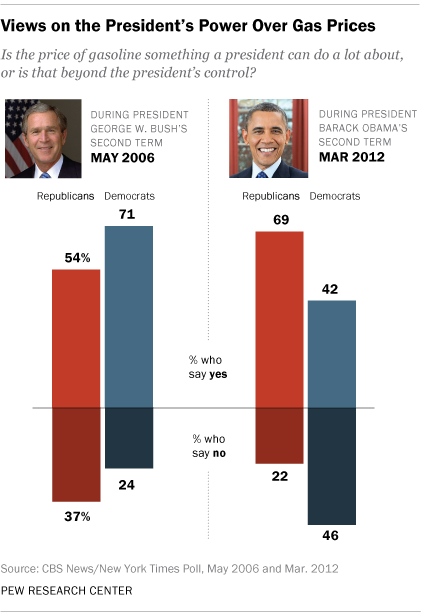 The shift was not quite so big among Republicans: 54% in the Bush-era survey said the president had power over gas prices, while about 69% expressed this view in March of 2012, a 15-point difference. “Our ability to perceive and interpret gas prices and presidential responsibility is the tool of our partisanship, not so much determined by our economic theories,” concluded a blog post by political scientist Charles Franklin of the University of Wisconsin, who is currently a visiting professor at Marquette University. For serious students of politics like Franklin, such partisan flip-flops are not surprising. They call it the “partisan filter” effect. Partisan filters — some might call them blinders — shape the way that Republicans and Democrats see many aspects of the world. Take, for example, views on the overall economy. Certainly the basic facts on the ground are the same: the unemployment rate, changes in the cost of living, the latest reading on the Gross Domestic Product. But the judgments based on the same data often are strikingly different. For example, during Republican presidencies, GOP partisans give more favorable evaluations to the performance of the economy than do Democrats — and vice versa when a Democrat calls the shots from the White House. In the latest Pew Research Center poll, Republicans were about twice as likely as Democrats to rate economic conditions as “poor” (49% vs. 26%). But back in September 2007, with the country poised on the brink of the Great Recession and Republican Bush in the White House, just the opposite was true: Democrats were about twice as likely as GOP partisans to say the economy was on the ropes (34% vs. 17%). The jury is out on whether there is a direct relationship between gas prices and presidential job approval ratings or voting preferences. Political scientist Larry Sabato found that “while the president is punished in the court of public opinion whenever gas is expensive, he receives no reward for presiding over times of cheap gas.” Others find little or no direct relationship between gas prices, job approval or candidate support. New York Times blogger Nate Silver summarizes the evidence here.